It may not have been No. 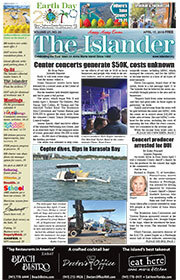 1 on the agenda, but it topped the conversation for Anna Maria commissioners at their June 23 meeting. The discussion was on how or whether to buy six vacant lots at Pine Avenue and Bay Boulevard that often are used by civic groups and the city to facilitate everything from festivals to parking to a trolley stop. Commissioner John Quam suggested the city should decide how it would use the lots before asking its taxpayers to consider funding the purchase — which is estimated to cost $3 million. Commissioner Jo Ann Mattick said she wants the city to buy the lots “before they’re gone forever,” and houses or other developments are built. The board seemed in agreement over the purchase, but some commissioners were unhappy that the bank’s asking price may be over fair-market value. Pine Avenue Restoration developer Mike Coleman, however, differed with that opinion. He announced prices paid in the $300,000-$400,000 price range for various PAR lots on Pine Avenue. But for lots with unobstructed views of the water, Coleman said the price should be higher. Coleman said PAR would contribute $100,000 toward the city purchase. Mayor Mike Selby had done some research on the values, as well as limits on the amount the city could borrow before exceeding the limit on its debt service. He also noted the city’s reserve fund is down to 20 percent. City attorney Jim Dye suggested that rather than financing a traditional mortgage, the city consider a land contract. If the city purchases the land for $3 million, the bank holding the property has offered financing and to withhold payments for two years to allow the city to obtain alternative funding, such as grants from state and federal agencies. The commission agreed to fast-track the matter, to come up with suggested uses, and to meet in a workshop on the subject of the six lots at 6 p.m. Thursday, June 30. In other business, commissioners gave unanimous approval to the Anna Maria Historic Green Village to construct stairs that will encroach on the front setback, but will resemble the original entry and steps for the Village Cafe at Rosedale. The commission also authorized a change to the village site plan to allow more seats at the cafe, 16 parking spaces for the complex across the street at Roser Memorial Community Church and the addition of solar panels over approximately seven parking spaces onsite. Commissioners also agreed to a schedule of budget hearings proposed by Selby. The first workshop on the 2011-12 budget will be held at 6 p.m. July 7, followed by another workshop at 6 p.m. July 21. At the commission meeting July 28, commissioners will set the tentative millage and roll-back rate.